I am WHOLE, I am PERFECT, I am COMPLETE"
I first heard this mantra two days ago in my yoga class and made a mental note to use it myself as well as to share it on this page. Come to think of it, that pretty much sums up my life: cool idea - implement myself - share on social media to inspire others. (It comes with some pretty nifty, swooping body movements which make it even more powerful). Every line is so individually powerful and I particularly like the symbol of the phoenix - so apt at this time of year - and so personally spot on given the turning point at which I find myself right now: four and a bit months into a year-long travel adventure discovering foreign lands and equally foreign parts of myself. This year was always going to be a catalyst for the creative destruction of the old and a re-birth of what is truly authentic. And serendipitously, this notion was made concrete yesterday on our first-day-of-the-year-trip-to-the-beach-for-a-cleansing-swim-in-the-sea. I had just spent the last minute whining out loud about how much I was missing my jewellery and that all I REALLY WANTED was a long necklace (I bravely left all accessories at home bar my large platinum hoops. Those that have known me a while can testify that these don't really count as adornments since they are pretty much a part of my ears after no less than 31 years' consistent wear). Next my beautiful new friend plonked a pretty, red, silk bag on my lap. And what was in it? 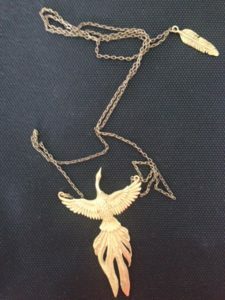 Just something she had felt should be mine when she saw it: a gorgeous, LONG, pendant necklace of a phoenix. So I now have a mantra and a talisman, both of which feature a phoenix. Each was delivered to me within one day of the other. I am taking this as a sign that I should add this powerful animal totem to my arsenal of spiritual guides for 2017: the goddess (Oshun) and my word for the year (Pleasure). Which is pretty cool. I might just become invincible. The mythical phoenix is also a universal archetype though and for that reason I'm going to share it with you; to offer you some of its purifying, creative energy to ease you into the New Year. Happy (continual) re-birthing into the very best version of yourself you can be! Did you enjoy this post? Let me know in the comments or by sharing it with other social media! I’d love to keep sending you updates so feel free to sign up to receive posts by e-mail and click subscribe. Don’t forget you can also follow me on facebook, youtube, twitter, instagram & bloglovin! I have been working for a while now on feeling “enough”: that I am indeed enough, just as I am, in all my glorious imperfection. Sometimes I get it and feel pretty invincible. Other times I lapse into believing the myth of fragmentation – that I can only feel whole with the input from someone or something else; a myth that is dangerously comforting in its familiarity. And whilst signing up for a My Word Goddess Reading for 2017, I thought I’d take another look at this year’s. Last December, I was introduced to the Goddess ISIS. My word for the year was REMEMBER. Both were incredibly on point. Because, just as Isis is famous for, over the course of 2016 I have been re-membering my true self as well as remembering who I was always meant to be. The year has been about subtraction, about shedding the falsely acquired beliefs and habits to unearth the divine blue print beneath. Not only does Isis tell us that we were never broken, that we have always been perfect and whole, but she also embodies the empowered feminine and the capacity to feel deeply. She therefore reminds us to acknowledge and accept the depth of our emotions. She also shows us how to create the life we desire rather than simply opposing what we don’t like – she creates as well as renews. So yesterday when I woke up feeling I had had enough of not feeling enough and that it was perhaps exactly this comforting familiarity which was preventing me from moving on, I decided to channel my goddess, Isis, and to take action. To ‘feel deeply’ and to acknowledge and accept my emotions by finally giving a voice to my mind gremlins. This is something I find very hard to do. So I indulged them, and wrote out one big, fat list of “I am not…..enough”. It pretty much extended into every aspect of my life: intellectual, emotional, spiritual, physical. It wasn’t pretty reading. But the exercise felt perversely good – I was clearing out the mistaken beliefs, releasing them from my head, consciously disowning them. The universe was clearly working in harmony with me yesterday because the focus for that afternoon’s restorative yoga class was clearing and cleaning out anything that no longer served us. And that night? The almightiest rainstorm I have ever witnessed! A spectacular light and sound show that lasted for about four hours, wiping out all of the power in the house and vicinity as though commanding us to watch, enthralled and humbled. Drawn to its magnificent energy - watching didn't feel like enough - I had a sudden urge to get in it, to be at one with this natural and cleansing spectacle. So I stripped off and stood under the heavens with hands raised upwards to receive and legs rooted in the shallow pool that used to be the lawn. I allowed myself to be soaked and purified by the incredible downpour; I roared in harmony with the thunder as the trees around me bent forwards in submission to the mighty power of the storm. It was AWESOME. And the best thing of all? My two girls, aged 7 and 5, came to join me. Well after their official bedtime. Here we were, three naked humans in the dark, in the howling wind and torrential rain, unleashing and merging our feminine voices in response to the thunderous masculine. We shared our natural wildness in a moment of pure, uninhibited joy, communing with the tremendous forces of Gaia. It is the unbridled and serendipitous moments like this one that remind me that clearing blockages doesn’t always have to be laboured. When you've done the hard work, then comes the fun. I’m so glad I indulged myself and allowed the girls to join in. It was a rare, spontaneous bonding experience that none of us will forget in a hurry. And just in case yesterday’s monumental efforts of journalling, affirmations, EFT, yoga and a family rain dance didn’t do the trick, I have consciously chosen to release the notion of unworthiness from my life this December. To let go of lack and of the sense of not being enough. After all, they’ve had more than their piece of the pie. It’s time to move on. Next year is about feeling WHOLE, PERFECT, ENOUGH. And so I turn to YOU - if you had something you wanted to release, what would it be? What have you had enough of? What sentiment is no longer serving you? How can you move one step closer to being the best possible version of yourself? Did you enjoy this post? Let me know in the comments or by sharing it with other social media! I’d love to keep sending you updates so feel free to sign up to receive posts by e-mail and click subscribe. Don’t forget you can also follow me on facebook, twitter, instagram & bloglovin! I often ask for guidance from trees. Usually whilst hugging them. I think that hugging them allows their amazing energy to flow into you somehow. If you let it. 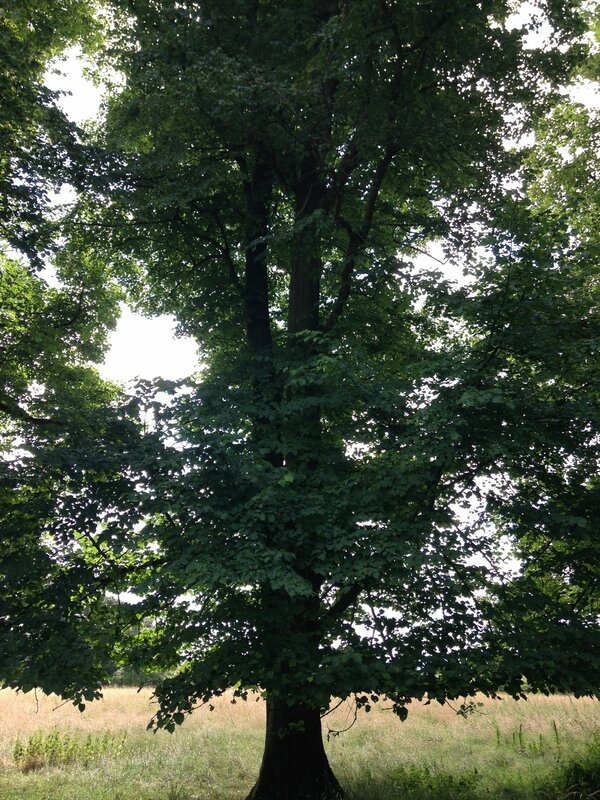 And for me, what makes trees amazing is their incredible ability to hold both polarities of strength and flexibility. Polarities might be the wrong word because they are not necessarily opposites, but for me they kind of are. Because I find strength relatively easy to channel (much easier to find your inner warrior than expose your vulnerable inner child) and I find flexibility much harder to summon up. Flexibility requires true, inner strength. A real, unshakeable core of knowingness that allows you to deviate from it without losing anything. (Which shows me that what I see as strength is often actually just false bravado or rather a shield covering up what I don't want to face or feel.) Today I was called upon to be flexible. I got a call at 4pm from the travel clinic informing me that the anti-malarial tablets we have ordered for our three children (to last us through 11 months of travelling through high-risk malarial zones) will no longer be available. Because the wholesaler is out of stock. They told me to "go online to source them from a large pharmaceutical chain or to get a private prescription from a GP and ring round some local pharmacies to source the right amount". All by myself. Just the 95 boxes of the stuff. ON A FRIDAY NIGHT. WHEN WE ARE LEAVING IN FIVE WORKING DAYS' TIME. I first saw these guys in April. They knew I needed the tablets in April. I have since spent nearly £6,000 with them on vaccinations for myself and my family. (Not because I want to - this is not a luxury decision - but simply because most necessary vaccinations are not available on the NHS.) And yet the answer when I questioned why I was only being told that they were unavailable now, was that they could have chosen to wait until Monday to tell me so actually they were being kind by telling me "in advance", today. My reaction? Shock. Horror. Overwhelm. Confusion. Anger. And disbelief. I spent a good five minutes questioning the status quo (ie. crying / being angry) before I was able to think about how I could possibly move forward. Unfortunately for the children, when I got the call we were on our way to a play date - half way down a busy road, in our waterproofs, in the rain - each of us on our bicycles including little Raphael, newly on stabilisers, who had already fallen over twice. In fact everyone had fallen off their bike once by this stage. And yet they patiently stayed with me on the side of the road for at least 45 minutes whilst I tried to sort out the mess. Unquestioningly. Trustingly. Sympathetically. They were amazing. But then they always are when I really need them to be. And fortunately for me, I live in the "provinces". A town in which your local pharmacist and GP switchboard do actually recognise your name when you call. And so I didn't do as the travel clinic had told me to do and instead I reached out for help from our local pharmacist. She too was amazing: by 6pm as she was about to close, she had already got on the case for me without having an actual prescription to hand, had found a contact within the HQ of the drugs' manufacturer who had requested a fax of our prescription when it was available, and they were going to contact all the depots across the country to source emergency stocks for us. Even those in Scotland. Note: this is the same manufacturer (GSK) that could not apparently be called by MASTA. And then the friend to whose house we were travelling for tea (and ended up an hour or so late for) then texted her best friend who happens to work for said manufacturer, for help. Incredible. So today I feet like I have seen both the worst side of people and the best: incompetence, laziness and arrogance from those I don't know, as well as compassion and efficiency from those that I do. And I was made to think on my feet. And to be flexible. To see beyond the current, emotional disaster and to think coherently of a plan B. Hopefully, fingers crossed, I will be able to source at least one month's worth of anti-malarials so that we won't have to change our flights or cancel our visas to Myanmar. We could then try to get some more on the road by diverting our onward journey via Bangkok. I hope that won't be necessary. 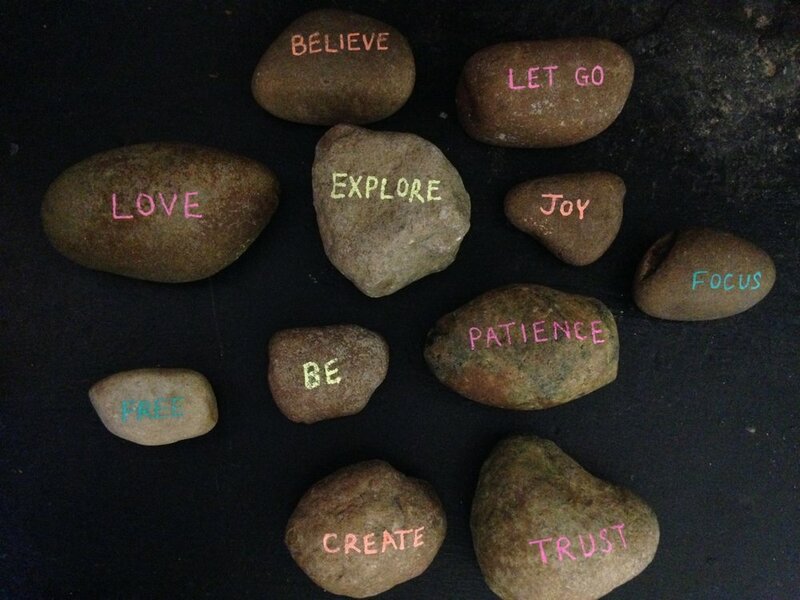 These are my “inspiration rocks”. Kind of like emoticons but of the natural variety. I picked them from the bottom of a freezing river bed in January and decorated them with words to inspire and motivate me. Every day, or when I remember, I pick one that feels right for that moment and leave it on my desk where I can see it. And somehow it seems to work! I find its presence both comforting as well as motivating. Perhaps that’s because it is a rock from a riverbed and therefore symbolises both earth and water elements? Traditionally, rocks represent the element of earth. This is ultimately grounding: it reminds us of our connection to everything, that we are all one, it reminds us of our physical form but also of the wisdom within us and of those that came before us. Water is an altogether different element. It is ultimately calming: it is about the emotions, cleansing, ease, flow, about taking the path of least resistance. So these rocks represent both elements to me and of course the word I drew onto them. And today’s word? It’s FOCUS. Because at the moment I feel full of creative energy but this needs to be channeled in the right way. In general, I’m more of a detail rather than a big picture person. And because I’m also a Virgo and want to do everything perfectly I often end up overwhelmed by detail and go round and round in circles rather than forwards. So today it’s about focusing on the big picture strategy and dissecting it from there. Baby steps in the right direction rather than a scatter gun approach that achieves not very much. If you could pick one of these stones today, which would you choose and why? Or better still, are you motivated to create your own? I got serious goosebumps listening to it. For me, this is just so inspiring - a woman who is not afraid to shake things up, not afraid to speak her truth, who calls on us to rise up and "resist" the status quo. And yet her message is also about purifying the heart, love and finding our divine soul purpose. If we can do that and become the "passionate freethinking adults" she is calling us to become, then, as she says, we not only become "difficult to manipulate" but also "impossible to control". Did you enjoy this post? Let me know in the comments or by sharing it with other social media! I’d love to keep sending you updates so feel free to sign up to receive posts by e-mail and click subscribe. Don’t forget you can also follow me on facebook,twitter, instagram & bloglovin!